The largest study of its kind which aims to discover why some patients respond better to resuscitation than others has finished recruitment and now looks to move on to the next stage. 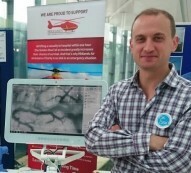 Microshock, a study being carried out at the Queen Elizabeth Hospital with the support of the NIHR Surgical Reconstruction and Microbiology Research Centre in Birmingham, aims to investigate the changes seen in the circulation of blood in the smallest blood vessels (microcirculation) during resuscitation in patients following a trauma injury. This is a joint study, sponsored by Kings College London, between Kings College London, University Hospitals Birmingham, and the Royal London Hospital which, depending on the findings, could alter the way in which trauma patients are treated. The process of gathering this information involves a technique called Incident Dark Field Microscopy which is a technique involving a hand-held plastic coated microscope being placed under the patient’s tongue, much like taking temperature. This microscope is connected to a video recorder and the investigator will be able to use that equipment to obtain video footage of the patient’s microcirculation. Dr Sam Hutchings, Consultant in Intensive Care Medicine and Chief Investigator for the study, said: “Traumatic injury and associated bleeding is the leading cause of preventable death in patients who suffer severe trauma”. “The reason why some people respond well to resuscitation and recover quickly while others may require weeks in intensive care or even go on to die from their injuries is the area we are exploring and hope to gain answers to.